RMT is a handy tool to help releasing new versions of your software. You can define the type of version generator you want to use (e.g. semantic versioning), where you want to store the version (e.g. in a changelog file or as a VCS tag) and a list of actions that should be executed before or after the release of a new version. Once there, your best option is to pick one of the configuration examples below and adapt it to your needs. If you are using a versioning tool, we recommend to add both Composer files (composer.json and composer.lock), the RMT configuration file(.rmt.yml) and the RMT executable script to it. The vendor directory should be ignored as it is populated when running composer install. Make sure you have ~/.composer/vendor/bin/ in your $PATH. RMT can be installed through phar-composer, which needs to be installed therefor. This useful tool allows you to create runnable Phar files from Composer packages. and copy the resulting Phar file manually to where you need it (either make the Phar file executable via chmod +x rmt.phar and execute it directly ./rmt.phar or run it by invoking it through PHP via php rmt.phar. For the usage substitute RMT with whatever variant you have decided to use. RMT also support JSON configs, but we recommend using YAML. You can use the command RMT config to see the merge result between _default and your current branch. Build-in version number generation strategies. The two forced option could be very useful if you decide that a given branch is dedicated to the next beta of a given version. So just force the label to beta and all release are going to be beta increments. Class in charge of saving/retrieving the version number. Prerequisite actions are executed before the interactive part. Actions can be used for pre or post release parts. changelog-update: Update a changelog file. This action is further configured to use a specific formatter. Option commit-message: specify a custom commit message. %version% will be replaced by the current / next version strings. Option destination: the destination directory to build the package into. If prefixed with a slash, is considered absolute, otherwise relative to the project root. Option metadata: an array of metadata describing the package. Ex author, project. Note: the release version is added by default but can be overridden here. Option default-stub-cli: the default stub for CLI usage of the package. Option default-stub-web: the default stub for web application usage of the package. Option pattern: optional, use to specify the string replacement pattern in your version class. %version% will be replaced by the current / next version strings. For example you could use const VERSION = '%version%';. If you do not specify this option, every occurrence of the version string in the file will be replaced. 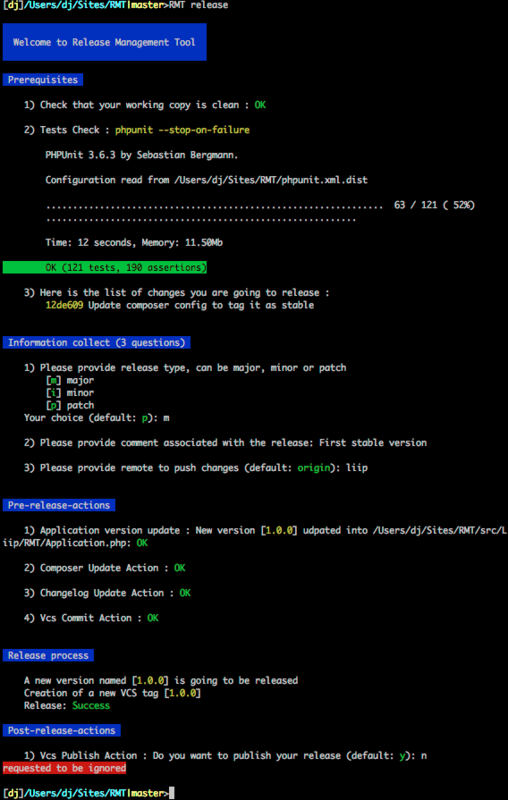 As an example, you can look at the script /bin/UpdateApplicationVersionCurrentVersion.php configured here. WARNING: As the key name is used to define the name of the object, you cannot have a parameter named name. Most of the time, it will be easier for you to pick up an example below and adapt it to your needs. If you would like to help, by submitting one of your action scripts, generators, or persisters. Or just by reporting a bug just go to the project page https://github.com/liip/RMT. RMT is licensed under the MIT License. See the LICENSE file for details.